PLANT YOUR FEET FIRMLY IN THE AIR! Tuesday, August 21 at 6 p.m.
…and answer all your questions along the way. SWINY’s private 90-minute event will cover as much ground as our informative stops and your curiosity allow. Please join us on August 21. 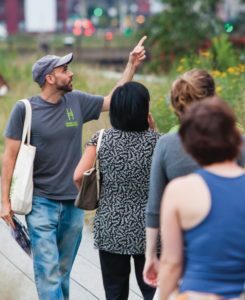 Make the High Line a highlight of your summer! This evening program is underwritten by SWINY, to keep the cost modest. Space is limited to the first 20 registrants. Registration closes at 5 p.m. on Thursday, August 16. Photo courtesy The High Line.